This mainstay of children’s birthday parties in Australia and New Zealand has but three ingredients: white bread, butter or margarine, and hundreds-and-thousands, which are better known as “sprinkles” in many parts of the world. To make fairy bread, dump a layer of sprinkles onto a large plate or other flat surface. Take a buttered slice of white bread and place it, buttered side down, onto the sprinkles. Press gently to ensure sprinkles adhere to the butter. Then lift it up, cut the bread diagonally into four triangles, and you have a colorful and child-compatible snack. Fairy bread can be served with crusts on or off depending on personal preference. Note, however, that the crust provides a handy, butter-and-sprinkle-free spot for your fingers to grip the bread. The identity of the first person to firmly press sprinkles into white bread is lost to history, but fairy bread was made as far back as at least the 1920s. Unlike simple foods such as toast and cupcakes, though, fairy bread has resisted the modern trend to artisanal-ize. 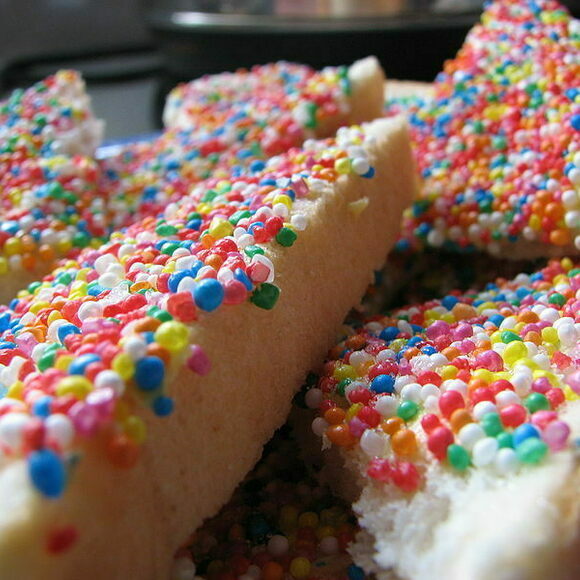 When a food writer suggested using a different kind of sprinkles and “a nice cultured butter,” Australians took a strong, pre-emptive stance against fancier versions of fairy bread. Fairy bread is rarely served in restaurants or cafes. So if you can't score an invitation to an Australian child's birthday party, making it yourself is your best bet.